Whole30 Review: It’s Not Actually a Diet, It’s Something More. I’ll admit, originally I though the Whole30 wasn’t just a diet, but something that had to do with eating or not eating grains, yet after reading the book, it turned out this plan was something completely different and really more, it was a plan to help people get healthier. Well if it’s not a diet, then I don’t need it…right? If this is how you feel when you hear that the Whole30 isn’t a diet, you should read the whole review because if you do follow this plan, you will lose weight, however, there is not a single thing in the book that encourages or talks about doing things such as weighing yourself or counting calories. They even made rules against that. How does Whole30 really work? The concept is this: Basically, if you’re eating healthy, you don’t have to worry so much about what the scale says or how many calories a food has, all of these things will regulate themselves and your body will react to it by working better and naturally losing the weight and that’s basically how the Whole30 works. You eat healthy from a list of approved foods they have. You eliminate 5 groups of foods from your diet for 30 days. Now while I was reading this book, I couldn’t help but feel I heard this concept of elimination of foods somewhere and I did eventually remember, it was from the Virgin Diet which had a more condensed approach to this. In fact, based on what I remember, out of the 7 foods the Virgin Diet tells you to eliminate from your diet, of them are actually mentioned in the Whole30 as well, with the one food that isn’t being eggs. But anyway the 2 parts of the diet I explained work together for 30 days. You eat healthy, but don’t eat certain things that aren’t healthy (5 food groups). Not all of them are actually foods, but the book provides a lot of evidence on why you should not eat those things and frankly, I agree with a lot those things. No dairy (most of it is not allowed). No artificial sweeteners and even sugar. Any foods or drinks that fall into those 5 are not allowed to be eaten or drank during the 30 days you are on the plan. Your goal is to eliminate those foods for those 30 days and then start to eat/drink them again, one by one to find out IF they affect your health in a bad way. A lot of health problems people face today can be traced to their eating habits and many of those BAD eating habits can be traced to those 5 food groups. Drink too much alcohol? Well you’re going to have hangovers, do foolish things, kill brain cells and not really help your health. Eat/drink too much dairy? You may have constipation, bloating and other problems arise, especially if they aren’t organic. Eat too many legumes? Well this is the one where I wasn’t in agreement with because I know in certain proportions, they can be beneficial, but they do say it causes gas and bloating which is true if you eat too much of them. Eat too much sugar? I have no problem eliminating 4 of these groups from my diet, but sugar is easily the hardest! I was recently sick and was on antibiotics and was drinking A LOT of tea, but instead of sugar, was using raw honey, but a lot of it. I ended up breaking out in more zits around the body. Too much sugar even if it is from an organic source is bad for the body. Eat too many whole grains? They also point to this being a problem, especially if it isn’t organic. You’re talking a lot of starches, carbs and other ingredients that are NOT good for the body in high amounts. Basically what Whole30 has done has taken any foods which cause inflammation, diarrhea, bloating and any negative reactions from the body and put it into those 5 groups. Eliminating those 5 groups eliminates you getting those problems again which is why there is a tremendous list of health benefits of being on this type of plan. Isn’t Whole30 just a paleo style of eating? If you read the food/shopping list of this plan, you’ll notice a lot of foods fit into the same category as those you would eat if you were doing a paleo diet. This plan even admits it’s very similar to it, but there are a number of foods and recipes they have which aren’t that way, plus legumes are technically included in a paleo diet but they aren’t allowed in the Whole30 plan. The interesting thing about a plan like this one is that there really aren’t any rules other than eating 3 meals or so a day from their approved list of foods and just NOT eating from those 5 food groups. That’s really it. They DO have a sample 7 day meal plan available. But all you’re doing is examining how your body reacts when it isn’t given those “bad” foods/drinks. When you don’t have them for a month and then start eating/drinking them again, you will know if they help you or not by how you feel. If by introducing a food from one or more of those food groups made you feel bad, then you need to eliminate it completely from your life and if it doesn’t make you feel bad, then you can keep eating/drinking it. This plan does have a stage known as the reintroduction stage where AFTER the 30 days of eating the way they asked you to, you eat a food/s from one of the groups for 1-4 days, then go back to the Whole30 plan for 2 to see how the body reacts, then the next 1-4 days, eat from another bad food group and go back to the same diet for another 2 and all the way until you go through all 5 groups, separately. This is how you examine what’s good and what isn’t. So from the Kindle version of the book, it looked like about 20% of the book was about the plan itself, while the other 80% was about preparing for every possible situation you can run into when doing this plan. They really cover everything…. Then there is also a HUGE chunk of this book which is devoted to recipes and they explain everything about preparing it to when to eat it, to even when to eat before/after workouts. There is an incredible level of detail to this. 3 out of 5 stars. Great health plan with very detailed options. While weight loss can come from this plan and it probably will if you’re unhealthy/overweight. Look at Whole30 as a health plan, not a diet. If your goal is health improvement with weight loss being secondary, Whole30 is a wonderful plan, though not a simple one. It isn’t just 30 days either, the 30 days are just the period without the certain foods, then there’s 10 days of reintroducing the bad ones, but that’s a speedier version. There is also a more long term approach where you decide how long you will need to be reintroducing the foods. I recommend the 10 day one because there is structure. But Whole30 isn’t just 30 days long, it’s a lot more if you really want to get it’s greatest benefits. The first 30 days “cleanses you” of the bad things, then the next 10 and all the days-months and possibly a lifetime after that is all about continuing to stick to it so if you followed this plan, felt great, keep sticking to it. Not a diet? Now that sounds like music to my ears! I think when most people even hear the word “diet” it turns them off, because it implies that there are foods you can’t eat, so diets don’t seem to work long term then. I like the fact that’s 30 days or your whole life. It is for long term and strict, but I’ve tried plans before and this seems to be the one that would work. I’ve got nothing to lose but weight, right? Well that and possibly eating habits you would have liked to have Rob! Actually this sounds pretty much like my meal lifestyle, when you are on a restricted diet many food groups you just can’t tolerate. The past few months I have eliminated many of the foods mentioned in your article and I have lost over 10 lbs and still counting. I am not able to eat dairy or grains, so my diet mainly is fruits, veggies and lean white meat. I also have kidney disease so no red meat allowed, it is a tough lifestyle to live but you will lose weight and be healthier with more energy. If you feel better for it, then it can’t be a tough lifestyle, not unless you want to break that and experience the hazards of the opposite approach Jeffrey! I commend you for sticking to this and losing the weight! This is a great review! I am actually considering this diet, as I found success eating a raw vegan diet however it became boring to me after some time. This book seems to target some of the core principles of a raw diet, however allows for modifications depending on your personal body chemistry. Thanks for the awesome info! Thanks for writing this interesting article! Their guidelines sound good to me and reminds me of something I tried over the summer and fall. I eliminated all sugar, dairy, alcohol, whole grains and fried foods. Within about a week I felt incredible–more energized, better skin and definitely slimmer. Over the holidays I slipped back into eating sweets and think I am due for another clean eating plan like this. It really works! Thanks for the reminder–I’ll definitely check out the Whole30 plan. I am glad I came across your review. I was not aware of legumes being a no-healthy group. What is your personal experience with them? Does your body accept them well? I eat grains in the morning, I think I will switch to fruits and nuts, they always feel good. As for dairy (guilty) I like my cheese but I will definitely cut it down to a bare minimum, I may even cut it off for 30 days. Legumes only in large amounts have made me feel bloated and a little bit gassy Manuel, other than that, I can’t really complain about them personally. It is a good idea to switch to something more natural like fruits vs something with carbs like grains. You may also want to start eating more healthy fats and protein such as eggs and avacado, you will feel fuller. Really good review on this Whole30 and I would definitely recommend this to my friends if they are wanting to lose weight. Having said that, I would still take a look at this book if I had the time. Also, not having those 5 groups of food for 30 days which is really long is really tough. Do you have any suggestions on how to stop your cravings? Thanks and good luck! Depends on which cravings you’re having. The most common strategy is gradually quitting whatever you’re addicted to week after week and if cravings come up to instead eat or drink something healthy to fill the appetite void/craving. 30 days is not cancer, or having your child deployed in a war zone, or buying a house and finding that the neighbor next door likes his music Loud and with extreme bass. 30 days is a drop in the cosmic bucket. There are more things that you can eat than not and you will never be hungry. We do this as a tune up every 6 months and the only things we return to now is whole grains, low\no fat dairy, and legumes in moderation. (None of which seem to cause us problems). You can do this! You have a good point Meg about looking at this diet compared to other, actual big events in life, but to some, this may not be the most suitable plan. Remember, some people just want to lose weight. I don’t quite understand about 2 groups – dairy and legumes. Ok they cause bloating but what’s bad about it? I do believe that benefits we gain by using dairy and legumes prevail the unpleasant feelings because of bloating, don’t they? Especially, legumes – they do possess a LOT of good qualities for our health and also help to loose weight, as far as I’m concerned. Well the thing is, those 2 food groups may not match everyone’s genetics Arta. Some people may benefit from drinking/eating dairy products and legumes, but there may be people who suffer from it and experience the side effects mentioned from the Whole30 book. That is why the deduction they use to identify which food groups mess with your body and help it is used to determine if you need them or not. Thanks for a great and comprehensive review. I’ve been trying to lose weight for so many years, but somehow always manage to gain it back after a couple of weeks. I have always relied on counting calories and/or exercise, and my interest was piqued when I read there was not a single thing in Whole 30 that encouraged or talked about doing things such as weighing yourself or counting calories. To answer your question, I have never tried Whole30 and would like to do so. However, I’m worried about my cravings for sugar and whole grains and tiredness during the process. How does it feel like when you tried Whole30? Were you often hungry and tired? Hi Princila, I have not tried all of the Whole30, but I have tried removing certain food groups from my diet for long periods of time and I will say, for my mood, I didn’t see much of a change, but I did experience more satisfaction from eating good foods overtime (although craving did hit a lot at first…). Now regarding sugar, yeah I can completely understand your position. What you can do is to stop eating the other 4 food groups and then see if anything changes, if not, then you may have to try and quit sugar for a bit to see if it changes anything. There are a few things I’ve done in the past that have helped me deal with that type of addiction and I think they’ll help you too! What?! No sugar, no dairy and no wholegrains? That’s tough for me as I love to eat them. I have wholegrain bread every now and then. I’ve always thought that wholegrains are healthy are better than refined carbohydrates, no? I like that there’s recipes included in the book as I love cooking. Thanks for sharing. I would like to get a copy of this book! Hi Yvonne, generally whole grain foods aren’t bad to eat in small amounts and on occasion, the real issue is proportion. If a majority of the foods you eat are mainly consistent of grains, even if they are whole, that’s a lot of carb intake for your body which may have bad influence on the body. I recommend you read Grain Brain, another diet book I recently read which talks about the exact same topic of grains, whole grains, carbs and why they are bad in the wrong proportions. So how does this compare to other diet programs that stress giving up maybe 1 food or group at a time. I have always liked the idea of giving up one thing at a time because that feels reasonable. They idea of giving up 5 groups sounds like a lot to me. How is this system able to adapt to people like myself who may not be ready to just drop 5 groups like this all at once. Well you can technically do it backwards and omit one food group at a time to see if there’s changes. But any group you omit should be tested for a few weeks. You may notice initial fatigue or “detox” periods. Give it a week. As for other diet programs, most of them stress the removal of carbs, not specifically food groups so that’s where Whole30 differs from them. Your review of whole30 was very nicely done and very comprehensive. It almost made me want to try it; but cutting out dairy for a whole month sounds terrible to me. The other food groups wouldn’t be so bad, although I might miss sugar for a whole month. I love dairy and I don’t have the side effects with eating it. Of course if I were to eat a lot of cheese all at once or all in one day, I might get constipated; but that isn’t usually how I take my dairy. I think that a lot of these are what our body will tolerate. I didn’t see where it said anything about cutting out beef, so I assume it is allowed? I like beef and do eat it occasionally; but I find I get bloated and lots of gas. Sometimes I even feel constipated. I lost weight when I tried the high protein diet years ago; but I was sooo miserable. Filled with gas and bloated most or all of the time I was on it. I guess we are just all different and our bodies tolerate or don’t tolerate certain foods individually. Are there specific macro-nutrient goals? Sounds like a pretty significant carb reduction which would lead me to believe Fats should play a larger role in your diet? Atkins/Keto-ish? Is this the case? Would be interested to check it out – I like the concept, but it would be hard to cut Diet Soda out of my life. Yes you are right, there is a big substitution of carbs with fats. The only “macro” goal I’d say is that this diet is mainly focused on exclusions of the foods that are just not suitable with your body, everything else is allowed, so long as the main, healthy ingredients of this diet are present. I have been through many diets myself before but I have not seen one like this (Maybe I just haven’t been looking hard enough). How has the diet been working for you to date? I have a rather slow metabolism and as such I have a hard time with almost all diets out there and this is definitely one I think I can try, I eat all 5 of those food groups! I would love to hear back from you about your experience. If anyone else has tried this diet could you also let me know? I have not done the Whole30 specifically, but I have been doing something more related to high fat eating and tips I took from the 3 week diet which also helped. I’ve noticed that a few of packages of frozen vegetables list a minute amount of sugar (< 1g per serving). I realize that the plan states "no sugar", but if I rinse the veggies before or after microwaving, will it be plan compliant? Thank you. I don’t think that something that has less than a gram of sugar will be a problem, so eat that and after, when you buy new foods, make sure they don’t have the sugar. Usually, the foods have starch and that is where the carb number comes from. I know the plan states no added sugar period. So the Whole 30 people would give it a no. They’re not against sugar itself though. If there’s no sugar in the ingredient list, that’s what you want to focus on. Hope that helps! 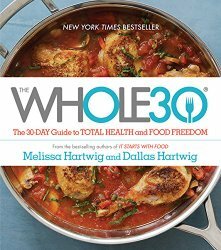 Great review about the whole 30. I can see this as a great tool to figure out what anyone could or should not eat by the way you described they have the system laid out. There are many plans and different systems all telling people what to eat or not and this system sounds like it has a little more on the ball with figuring out what actually works towards your health and what doesn’t. One thing I noticed is the 5 food group restrictions. It did not say no processed foods. It should state no processed foods allowed. Try finding a processed food item that has no grain and no sugar. The idea of adding restricted food groups back into the diet is good. It helps pinpoint the bad actors. I tried a major change to my eating habits by eliminating all processed foods and most dairy products. The toughest was not eating bread. I love dark breads! But adding lots of veggies, eliminating processed foods, eating only lean protein (grass-fed beef, chicken, turkey, pork etc), minimizing fruit, drinking water (with occasional wine), I lost 25 pounds in 2 months. I felt a lot better. There seem to be a lot of “paleo” style diets out there, like to banish the word diet and call something a life style change your much more likely to stick to it! I can see how this diet, the whole 30 plan works as you essentially cut out processed and refined food, I could probably do it short term but living with out diary is tough. Would I get results doing it for 3 weeks? You would see results after 2 weeks and more after 3 Steven, but it wouldn’t be consistent if you just went back to eating the things they don’t allow. A alternative 3 week diet like this one would help you drop more pounds. I followed this diet for quite a while, although admittedly ate less meat than the plan calls for. I felt great, and still follow it in a less strict form nowâ€“still no legumes as they upset my digestion, no sugar (well, rarely), a small amount of dairy (a bit in my coffee), no alchohol, and no wheat. The only grains I eat now are quinoa and occasionally a small amount of rice. I have a lot of digetive issues (gluten intolerance) and this diet has served me very well. I wholly recommend quitting sugar and wheat, and limiting dairy as much as possible (I find many people can tolerate small amounts of organic yogurt and butter). I had great success on this diet! As we all do, I had fallen into some bad habits. A sweet treat after lunch, finishing the milk in my kids cereal bowl, half a bottle of wine per night with dinner and snacking on processed foods when I felt hungry or low energy. Pounds were slowly creeping on, and I turn 50 next month! Something had to give! I love that this is ONLY 30 DAYS! Every comment that negates one part of this diet or another… I respond to you: It’s only 30 days! If I can give up wine (while my husband has a couple every night with dinner), YOU CAN TOO! And you know what? I like myself better! I am on day 36 and have decided to make this my way of life! I have lost 10 lbs in one month…and my 5’4″ frame looks and feels better! Not only that, I am thinking more clearly and much more confident! Sure, when I started this diet, I was complaining to my friends almost daily! I felt crabby and hungry! Then, about day 14, I went shopping and really stocked up. Things like cashew butter on celery and kombucha helped me through! Kombucha has a fermented fruit flavor, it takes getting used to. I enjoy it as much as a glass of wine! I could go on and on but I highly recommend this diet for many many reasons! Best of luck to you all who embark on this journey! You won’t regret it. I’ve been on this journey a long time now via Paleo. In my opinion, Whole 30 is very close to Paleo and should achieve the same results. Legumes are not allowed on Paleo. The basic rule of Paleo is if you couldn’t eat it raw, don’t eat it. And of course, no animal milks. Whole 30 allows all of the nightshade family, which Paleo does not. Some Paleo plans only allow the nightshades you could eat raw, such as tomatoes and peppers. Strict Paleo allows no nightshade family. Paleo does allow honey and maple syrup (in small amounts), which Whole 30 does not. And Whole 300 is correct in saying no honey or maple syrup if you want to clear inflammation. I lost 70 pounds my first 6 months on Paleo and have done a Paleo rotation diet on and off for 20 years. I kept coming back to it cause it works for me, so the last few years I decided to just stay with it. I have numerous food sensitivities (caused by leaky gut ) and Paleo made a huge difference. I suffered from a huge list of maladies. Almost all of them disappeared in a week to a month on Paleo combined with abstaining from offending foods I was sensitive to. I can now tolerate many of the foods I couldn’t eat before, but some, like wheat, milk and cane sugar, cannot go back to as a regular part of my diet. In the past year I added cultured milks, fermented vegetables and bone broths. But found I did better with no milk and just the cultured vegetables and bone broths. The fermented veg was the missing link for total gut happiness for me. Now even a foray into non-Paleo doesn’t bother me, providing I keep it to one meal a week or a little taste of something once in a while. Most weeks I just sail though with no deviation from Paleo. However, it’s been hard to stay the course in November and December, I often fall off the Paleo wagon during the holidays. I’ve found it’s best to just forgive and forget and get back on track. Also, before embarking on Whole 30, it’s not a bad idea to get tested for food allergies/sensitivities if you suspect you have them. Or if you find your symptoms getting worse after a week or two on Whole 30 (like hives, reflux, skin rashes, asthma, edema, acidic stomach, itching, ear aches, etc. ), get tested. I happen to be sensitive to eggs, chicken, pork and beef. So eating eggs everyday for breakfast wouldn’t work for me. However after abstaining from eggs for a few years, I can now eat them a couple times a week, same with chicken and beef, but wouldn’t chance eating them every day for a month. If you find you have sensitivities, just take that food off the allowed list, abstain for 6 months and try it again. One last thing, follow the authors’ advise on preparing for how to navigate this plan. It will make a big difference in your success! Best of luck! Hi I am interested in the whole 30 plan, I am looking for a meal plan for one week so that I can plan my meals. I can see how narrowing down your diet to find areas that cause negative effects can be helpful. However is the problem with the food or is it something in the food. Like is grains the problem or is it the genetic modification or the chemicals used to grow it. It sure brings up many questions. Thanks for your view of the book. Hope you report what you find out with this experiment. Most grains are processed nowadays Jason and the author actually does point to wheat from the caveman days being very healthy but since that was before farming, I don’t know how people got it. Oh no, no alcohol, I don’t think I could cope with this diet without my daily single glass of wine whilst I’m cooking the evening meal. It’s something I would really miss. Anyhow, I’ve read somewhere a glass of red wine each day is good for you. Looking at this diet in more detail, I think many people will have a problem with it. If you’re lactose intolerant then it may be easier and a suitable diet but again, I could not easily give up my cup of tea with a dash of milk.I love wholemeal bread so there we have it, this diet is not for me. P.S. I wholeheartedly agree with the no sugar or artificial sweeteners! The problem I have with something like this is that everyone is different. People react differently to different foods. I agree that we should avoid alcohol, dairy, and wheat. Those things are generally best avoided anyway. But there will be many people who will avoid the things listed in this book but still have problems because they are still eating something else that they have a food intolerance to. You’re right Marcus. I think the Whole 30 wasn’t created for everyone, but for people who have symptoms for which those 5 groups of foods are responsible for. This is quite interesting. My sister-in-law went on the whole 30 diet last year I think. She’s already healthy but she’s always trying out new diets. I’m not sure what she thought about it, but it was a big fad in my wife’s family for a while. I agree with not counting calories and weighing in though. I was a calorie counter for a long time, and it just gets tiring after a while. But the hard part is finding a diet that works even if you don’t count calories. I’m not sure if I’d have the discipline called for by this diet, but it does sound promising. If your sister was doing this diet for a long time, I’m surprised she is looking for others Abdullah. Other than the 3 week diet, this one would have worked if she did it more than once. Interesting review, though I must say that I personally wouldn’t really start a diet that prohibits you to eat legumes, to me it seems quite strange not to be allowed this, as they are known for their fibers. Anyway, I really like the other things it brings forward, so it may lead to good results. The legumes part also surprised me Ashley, but even though they are generally very healthy, it’s for most people, but for certain ones it can be bad and the Whole30 is trying to help them identify if they have problems with it. Some people may not know if they have allergies or adverse affects from eating, say peanuts, which are legumes and may be eating them right now and wondering why they don’t feel good, but this plan would help them find out. I have always beleived that in order to lose weight it is not necessary to starve yourself everyday. The right thing to do is to simply eat what the body was meant to eat, and that is natural and healthy stuff that are not processed foods. That is my opinion, anyway, so I agree with the idea behind this book.